Today's environments can create tired, dry eyes. 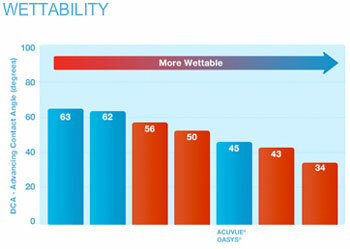 With ACUVUE ® OASYS™ IN, Dry is OUT. Whether you are inside or outside, challenging environments can make your eyes feel tired and dry. 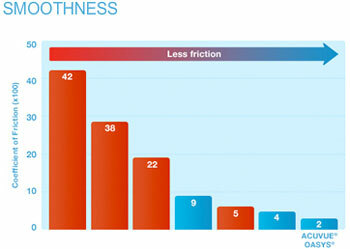 Comfort and freedom are what ACUVUE® OASYS® Brand Contact Lenses are all about. Long hours in front of a computer can leave your eyes craving moisture. The lens is designed to be worn as a two-week daily wear lens which means you take the lenses out each night. One lens can be worn up to 14 days. They can also be worn as an extended wear lens which means you can sleep in them for up to six nights. 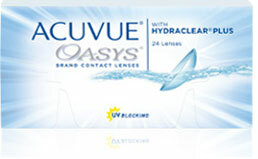 Find relief with ACUVUE® OASYS with HYDRACLEAR® PLUS*** Brand Contact Lenses. It will almost feel like you are not wearing lenses. Lenses with HYDRACLEAR® PLUS wetting technology are better than conventional hydrogels at mimicking the naturally smooth way your tears cover the surface of your eye. HYDRACLEAR® PLUS technology mixes the wetting agent into the lens formula itself, making them feel so smooth you'll barely know they're there.